I got to point with it then just kept giggling, which made it worse! I blame the food colouring, made the icing too runny. That's my excuse and I'm sticking to it! I thought it was some nasty grub you dug up on your veg plot Kev. Only joking. It's brilliant! It's a big one so I don;t know what he's been eating! 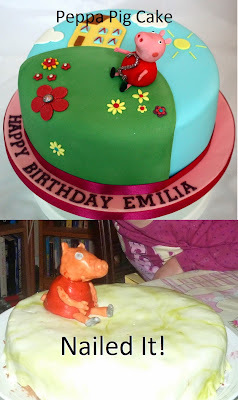 I still think Phillipa pigs cake was the best I've ever seen and it always makes me laugh. 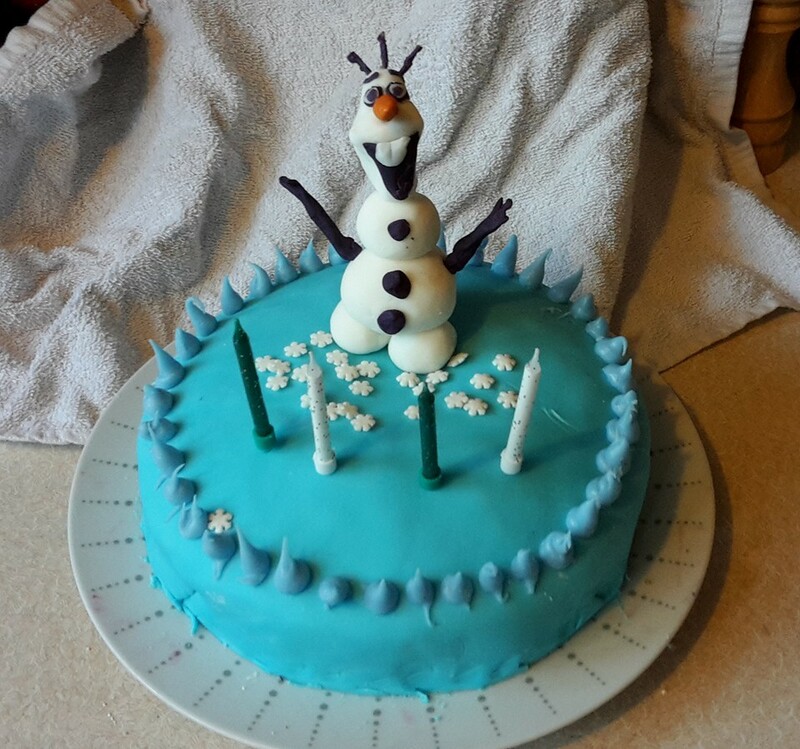 Still, great job for the Olaf cake, let's hope for a repeat on the day of the party. I doubt I'll be allowed to do the same design! It's a lvoely time of life and we try to make the most of it when we can. I don;t think that my range of sponges and cookies would quite cut it I'm afraid! That cake is brilliant ! having been proud of my attempt at making a Tardis cake up to the sad moment when the fondant decided to slowly slide in bulging billows to the plate ...I quite appreciate Pippa! I feel your pain, it can all go wrong so quickly! Happy Birthday to you oldest! Good lord.... I wouldn't know where to begin. Congratulations to both you and your 4 year old daughter. The last four years have flown by! There's plenty I can't do - you just don;t see it on this blog! Party isn't for two weeks as we thought it might be a bit much with a four day old baby! Excellent cake, love your blog Kev. The Olaf cake is wonderful! On birthdays in our house I baked, DH decorated, Teenage Mutant Ninja Turtles were very much 'in' then, as was Duckula, we had some very 'different' cakes! I rather like Phillipa pig, she reminds me of a perma-tanned woman I worked with years ago! 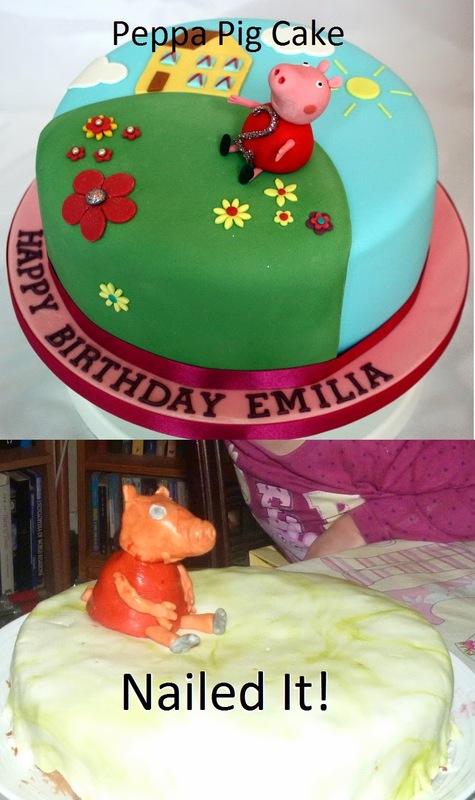 I think we all know a Phillipa pig from our lives from somewhere - whether we'd want them on a cake or not is a different matter! I wonder what cakes I'll end up making over the next ten or so years? 2) It must be time to wish a very happy 5th birthday! My eldest turns 10 in two days and all I can say is cherish these times, soon it will be electronic gizmos like handheld consoles and mobile phones that are the order of the day. No matter how hard you try to shelter them from the brain cell killers, all their friends will have them so you've already half lost the battle. You do have one advantage over me though, you have a homestead garden and plenty of space to run around, vs my flat in a city. I think I'm going to give you top marks for dedication - I can't believe you're reading them all in order! And you're right about the 5th birthday! She's had a great day and has asked for nothing and been very pleased with her gifts. We've been out for the day as well which has been brilliant despite the rain. I'm hoping the space will encourage them out more when they're older although I know I loved my computer when I was a teen and they weren't even very good in those days!